These shelves are now finished and styled. To see them click here! 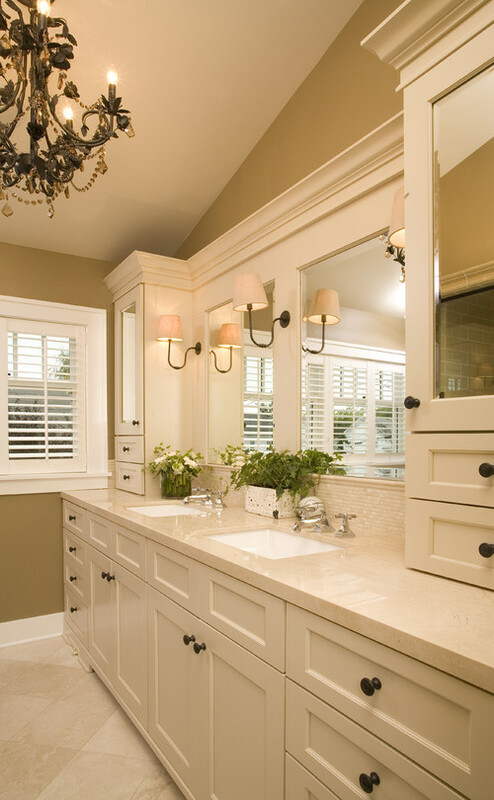 Our Master Bath is pretty small when you compare it to Master Bathroom's in newly built homes. A master bath (or "ensuite") wasn't an important component when checking off "must-haves" while house hunting. If the master bedroom included an ensuite, then we were getting more than what we needed. So hurray for a master bath! Our master bathroom was probably the most updated room in the house when we bought it. It had new tile, a new jacuzzi tub, adequate stock cabinets and new countertops. I love the tiling job in the bathroom - they did a great job choosing neutral colored tile while adding detailed trim tile. The photo above shows our toilet sitting next to the tub/shower....pretty bare and in need of some jazzing up! We really could use more storage in the bathroom and above the toilet looked like the answer. Who couldn't use more storage in their bathroom? 1. 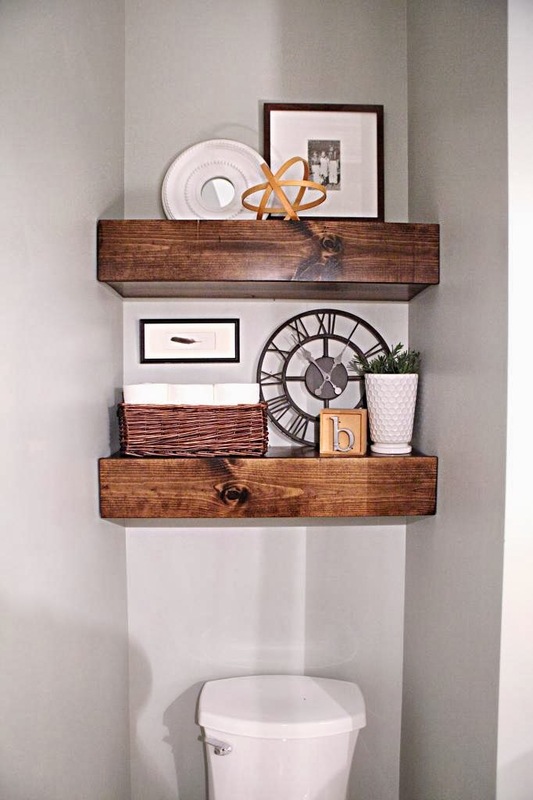 Floating "Spa Like" Shelves - Who doesn't want there bath to look "spa like"? So with the above inspirations and DIY plans in mind I started building. Actually, I put Eliana to work... Just kidding, but she almost has the hang of it after watching me project after project. She put the screw in backwards, but has the general idea of how the drill works. Good Job Eliana! I will post detailed directions on how I built my floating shelves with lumber, cut list and dimensions soon! I got the skeleton of the shelves onto the wall and was happy with the placement and size so far. I then added fronts to the shelves (and got to use my new table saw to rip these pieces to the exact size I needed!) Then added painters tape and started mapping out how to finish these - stain or paint? I placed a few items on the shelves to get an idea of how they were going to look finished (and because I was excited with how they were turning out). I ended up deciding to go with stain - I fell in love with those inspirations photos above so why change it up? The can recommends at least two coats so after a second coat I got exactly what I wanted! They are currently drying upstairs as I write this post. I can't wait for them to finish so I can remove the tape and start styling them. 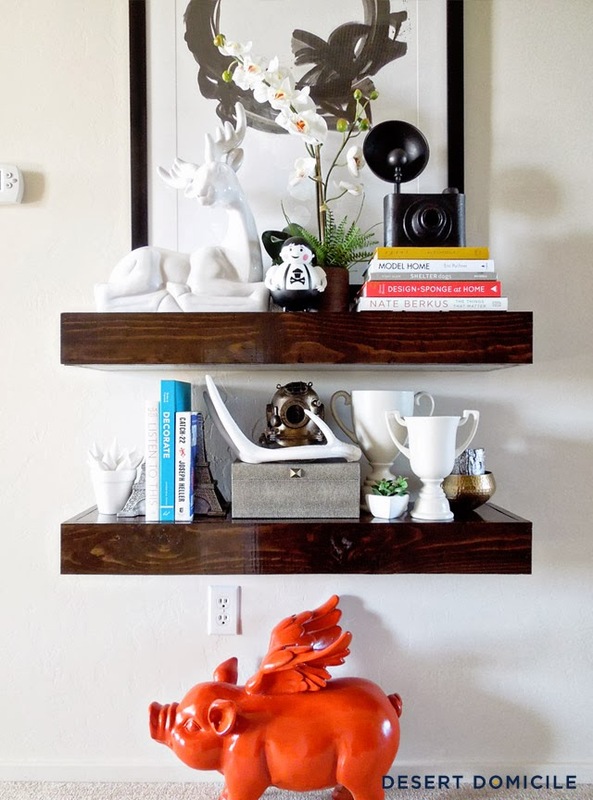 I will post the finished project and a tutorial on building floating chunky shelves soon!